So, you have gone for a nice vacation on a secluded beach. You are lying on your beach blanket under your big sun umbrella reading a book. The kids are out swimming and playing in the surf. It is a beautiful day and there's not a care in the world. Suddenly you hear little Johnny screaming. You look up and are horrified to see his tiny body being carried out to sea by a powerful force of nature. Johnny has been caught in a rip current, also known as a rip tide or undertow. About 150 people die every year because of rip tides, and little Johnny will too unless you have taught him what to do when he gets caught in one. If little Johnny happens to be swimming in the water near your beach blanket as the tide is going out, he will get carried to the right along the shore by a powerful current, and then he will get pushed out to sea as the water flows through the channel. The current in a rip tide like this is moving along at a surprisingly fast clip, and there is no way Johnny (or an olympic swimmer for that matter) is going to be able to swim against it. Floating is the best course of action for a child. There is no way the child will outswim a rip current once it is pushing through the channel. If your child tries to swim against the current and becomes exhausted, he/she will drown. Staying calm is important, but so is yelling. People on shore need to know that there is a problem. Once through the channel, your child can swim back to shore. In some cases, it is possible to find and stand on the underwater sand bar. If you attempt a rescue, make sure you have a floatation device like a life preserver or an inflatable raft with you. You don't want to get out there and become exhausted as well. NEVER leave a child unattended at the beach. Teach your child what to do if caught in a rip tide. Make sure your child knows how to swim. Given a choice, you should avoid beaches that do not have lifeguards on duty. Avoid beaches that have known rip currents. If possible, time it so that you are playing in the water when the tide is coming in rather than when it is going out. Have an inflatable raft, life preserver, etc. available. 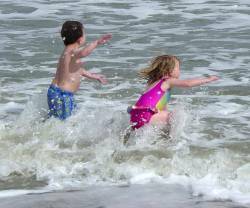 Consider having your young children wear a life preserver when playing in the ocean.